The cluster of differentiation 4 (CD4) molecule functions as a co-receptor for MHC class II binding to TCR in T helper cells. A CD4 epitope deficiency was identified in the swine MeLiM (melanoblastoma-bearing Libechov minipig) strain, a model for spontaneous cutaneous melanoma development and regression. Extensive sequencing revealed a high genetic variability of CD4 and the existence of several haplotypes segregating in MeLiM. Forty polymorphisms were identified in the coding sequence, out of which 20 correspond to non-synonymous variants and 10 are located in the 3′UTR of CD4 transcripts. One of the haplotypes segregating in the MeLiM explained the epitope deficiency observed. 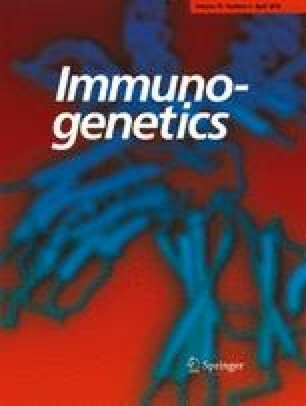 An association analysis between CD4 genotype and several phenotypes related to tumor regression was performed in 267 animals. An association was evidenced between a MeLiM alternative CD4 haplotype and skin and eye depigmentation, as well as the extent of hair depigmentation. Also, seric IgG concentration was shown to be higher in pigs carrying the alternative haplotype at the homozygous state. In conclusion, the genetic variability of the CD4 gene is associated with immune response-related phenotypes in MeLiM minipigs. FB was a post-doctoral fellow from Institut National du Cancer. The authors are thankful to D Esquerré and Dr J Estellé who initially performed and analyzed whole genome sequencing of MeLiM (INRA Plateforme Génomique in Toulouse and GABI unit). Finally, the authors wish to acknowledge Dr N Bertho, Dr I Schwartz-Cornil, and Dr A Prévost-Blondel for fruitful discussions and Dr Bertrand Bed’Hom and Dr Claire Rogel-Gaillard for active support. This work was funded by Institut National du Cancer, in the frame of the projects [PL-Biologie et Sciences du Cancer INCa_5982 and INCa-ITMO Cancer inside the plan cancer 2009–2013—project MeLiMun], CEA (Commissariat à l’Energie Atomique et aux Energies Alternatives), and INRA (Institut National de la Recherche Agronomique). All animal experiments were carried out according to European ethical laws and under approval of the Committee on the Ethics of Animal Experiments.